Castle Home Video have tried to make amends for their atrocious first stab at Blue Velvet (a full-frame transfer with PCM sound) with a greatly improved re-release, presented in letterboxed format with Dolby 2.0 stereo. The film is presented in its theatrical ratio of 2.35:1, but, despite the misleading packaging, it’s not enhanced for 16:9 sets. There are two versions of the disc available in the US, (both 16:9 enhanced) but they lack one impressive feature that the latest Region 2 UK disc has: a very interesting forty-five minute interview with Dennis Hopper. About a quarter of this programme is devoted to Lynch’s movie; the rest covers an eclectic mix of movies, almost entirely ignoring the well-known hits (Easy Rider, Apocalypse Now, etc), and focussing instead on some of Hopper’s most personal projects. The best version of Blue Velvet available is the MGM's Region 1 Special Edition (released in June 2002). This contains a new transfer (supervised by David Lynch), a 5.1 audio mix and a seventy-minute documentary, Mysteries of Love, among other less substantial extras. This disc does not include the Hopper interview from the UK disc, however, so dedicated fans will want to own both (the Region 2 disc is often available very cheaply in sales). 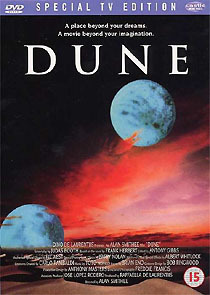 Four years after Lynch’s ambitious science-fiction epic Dune was released a special TV edition was released without his permission. It added about fifty minutes to the running time of the theatrical version (including a seven-minute prologue illustrated with artwork and starscapes). The TV version salvaged material from the cutting-room floor, and included sequences with incomplete or missing special effects, and scenes scored with music clumsily pasted in from other parts of the film. Although it adds significantly to the story (and straightens out some sequences that are now presented as they were originally scripted, even where it spoiled Lynch’s own editing), it’s still not enough to complete the jigsaw, and it probably still omits as much material (shot or scripted) as it reinstates. As well as completely new scenes, the TV version also adds material to scenes in the theatrical version. Lynch understandably disowned the 1988 version, which many fans feel is an abomination. (The TV version replaces Lynch’s name on the credits, naming “Alan Smithee” as director, and “Judas Booth” as writer). For a very long time the only copies of the TV version in circulation among fans were bootlegs of the original broadcast, or copies of the expensive Japanese laserdisc (replete with subtitles!) Now a much better option is offered in the form of Castle’s new Dune - Special TV Edition DVD (CHV 5008), which complements their Region 2 release of the theatrical version (CHV 5000). The TV version is presented full-frame, significantly cropping Freddie Francis’s Panavision (2.35:1) cinematography, and is relatively grotty, (not terribly surprising if the original version of this edit was an eighteen year old NTSC videotape). The new disc lacks the Dolby Digital 5.1 on the theatrical version, settling instead for a 2.0 stereo (not 1.0 mono, as the sleeve claims).